Google Air Quality & Pollution Widget Seems Off? Home > Google News > Google Air Quality & Pollution Widget Smells Off? Google Air Quality & Pollution Widget Smells Off? 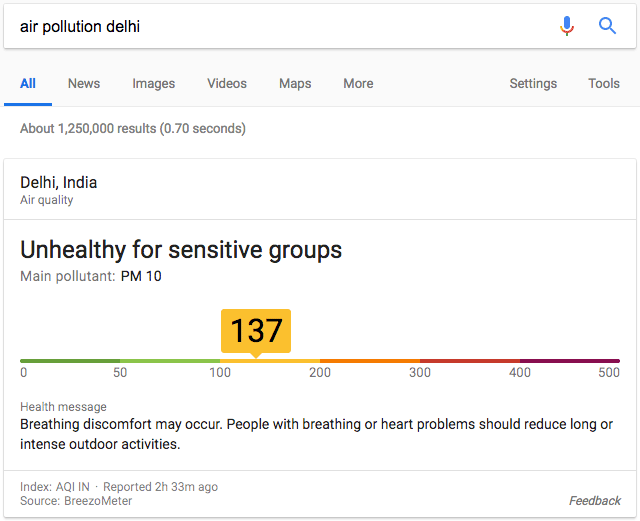 As I covered at Search Engine Land yesterday, Google launched a new one-box answer for queries related to [air quality] or [air pollution] - you can of course Google city variations, like [air quality beijing] or [air pollution delhi]. It works on desktop or mobile and is powered by a company named BreezoMeter, you can also click through to their web site to get more detailed information about the air quality in that location. 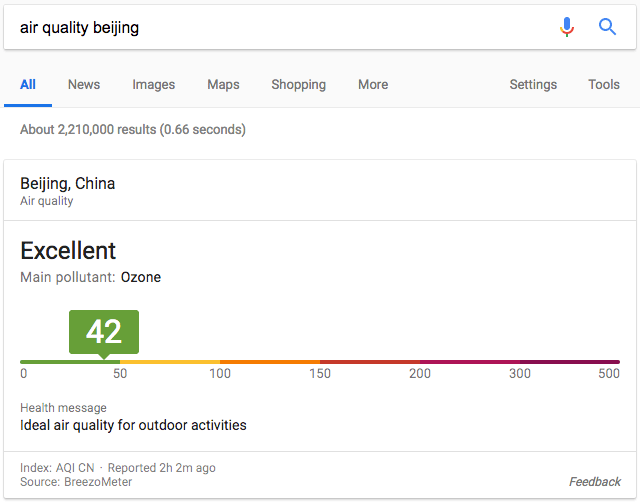 I know the data is updated hourly or so, and I am no scientist but can air quality in Beijing go from an unhealthy score of 187 to a healthy score of 42 within 20 hours or so? Air pollution is very dynamic: over the course of just one day, air pollution can vary significantly, from hour to hour (temporally) and also street to street (spatially). Different pollutants from different emission sources (cars or factories, for example) have different effects on the overall air quality, and weather factors like temperature, relative humidity, wind speed and direction, atmospheric inversion, precipitation and sun radiation can all impact the situation as well. Even in the most polluted cities such as Beijing or New Delhi, air quality is not terrible all day, every day. 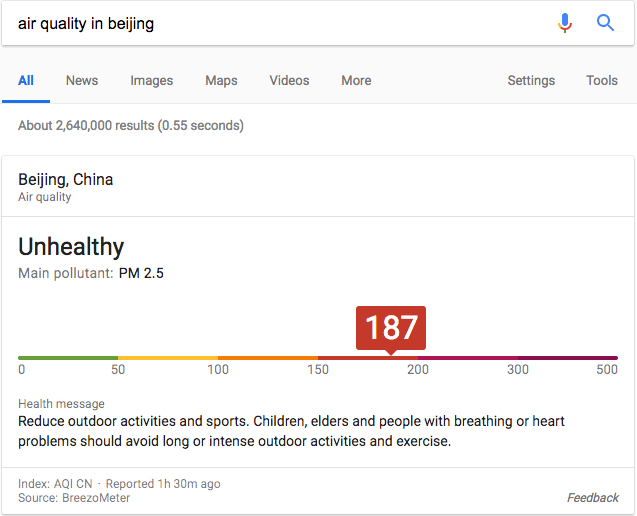 Estimating the times that the screenshots were taken, we looked into the data to understand better what was going on with the air quality in Beijing. It looks like there was a period of low pressure and low wind speed prior to the first search, which contributes to levels of PM2.5 building up. 20 hours later, when you checked again, the barometric pressure had increased, along with wind speeds, helping to disperse the particulate matter that had accumulated, and ‘clean up’ the previously polluted air. By clicking on “Source: BreezoMeter,” you can find more valuable information which helps visualize how air pollution is dynamic and localized and includes other features such as 12-hour history and forecast. The data presented on the Google air quality cards represents only the latest data from the nearest governmental monitoring station to the city center that was searched. While this gives one indication of the air quality, there is a fuller picture to be understood as well, and that picture is one that incorporates all of these other layers of data, such as traffic, local weather, air dispersion models and more, as well as mechanisms to bring the data to real-time, as opposed to "last available reading."